Hello, my name is Brittany. I am 27 years old, and I’m from a small town in east Texas. Since a very young age, I allowed the enemy to tell me that I wasn’t good enough… that I had to be just like my sister, or that I didn’t matter. 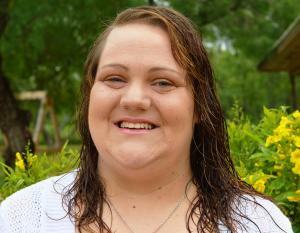 I became saved as a teenager, but I ended up pregnant at the age of 16 years old. My parents thought it would be best if I had an abortion. I became even more depressed. I ended up being so angry at God, my family, but most of all myself. Throughout my life, I got into many toxic relationships trying to find out what I was missing. I turned to drugs and I finally got to the point where I knew I was going to end up in jail or worse if I didn’t change. I went to my parents and asked for help. This is how I ended up at Adult & Teen Challenge. Since I’ve been in the program, I have begun to let go of my anger. This is why I stand on Proverbs 3:5-6 “Trust in the Lord with all your heart and lean not on your own understanding. In all your ways submit to Him and He will make your paths straight”. I now know that I can’t do it on my own. God has mended relationships in my family and I know that there are only greater things to come. Freedom From Addiction Banquet - CLICK!